Okay, perhaps, not all that secret but here is my way to up the grade on homemade apple pie or apple crisp. When I first started baking, my mother’s ‘secret’ suggestion was to add lemon juice to the apple dessert prep. Fresh lemon juice does up the apple/cinnamon taste and people often wondered how my mother’s apple desserts were just a wee bit better. I was an abstract artist in college and this inclination has seeped down into my baking and sewing over the years. In other words, I never leave well enough alone if I get inspired to add something more. So, this is how my latest apple dessert preparations has evolved. 1. Wash, peel, and slice the amount of green apples you will need for your planned dessert. When they are on hand, I will often throw in a couple of sweeter apples, too. They break down a bit more in baking and sort of form an applesauce texture to the more firm green variety. 2. First, I zest the lemons and limes and set it aside. Then toss the prepared apples with the juice and let them sit a minute while I gather the spices and sugar. 3. I usually use up to 3 teaspoons of ground cinnamon. Use a good quality one as the ones on the grocery shelves can be a bit bitter. My go-to for the best cinnamon is The Spice House which is on-line. To the cinnamon, I add half a teaspoon of ground cloves, 1/4 teaspoon ground nutmeg and a smidge of salt. 4. Depending on your recipe, mix the spices into one to two cups of granulated sugar. Add the zest of the lemons and limes. 5. Combine the sugar/spice/zest mixture with the apples. If you really want to deepen the final result, a quarter cup of brandy works very well. 6. Add a quarter cup of cornstarch, mixing in well. This is what will hold the apples together a bit after baking. 7. This is my final secret. Put the prepared apples into a bowl or container, cover and refrigerate at least one day before using them in your recipe. My batch for this Thanksgiving got a two-day soak. 8. When you get to making your pie crust, substitute a quarter cup or so of the water called with vodka. It makes for a more tender crust. Time is wasting so one guess what I’m about to put into the oven! Quilting the World . . . I love to quilt. I enjoy the challenge of taking bits and pieces of different fabric and turning them into a whole cloth again. When you sew a dress or suit, you have to keep in mind how the various colors and patterns work together. You would never sport a striped blouse with a flowered skirt. In quilting all these rules are left behind and you find the oddest combinations seem to work amazingly well. I am beginning to see that our world is a lot like a quilt. We all come in different colors, patterns and sizes. Alone we are something but together we can make a formidable whole. We all have a place in our world-wide quilt of humanity. Each person is in his or her place as a part of a pattern that wasn’t designed by mortal hands. Our free will, however, is starting to make a difference in the fabric of our lives. When you make a quilt, each piece, square, triangle is stitched carefully to the next one. Each segment is dependent on the pieces connecting it to the whole. Because one piece is in place, the rest can be built accordingly. The pieces of a quilt provide a meaning and basis for the entire quilt. The world’s quilt is starting to miss spaces. The solid fabric of its connecting pieces are fraying and disappearing. God sends children into the world to step into the places left by the souls called to Heaven. He keeps older people in the world until He calls them to their eternity. Mankind has been arranging its quilt without consulting God. Abortion leaves empty spaces and euthanasia leaves gaping holes that bring down our solidarity. You look around at your friends and relatives and wonder what life would be like without them. How many other people should be in our lives that were not given the chance to take their place in our quilt? I have heard that abortion and euthanasia weed the unproductive and unneeded. Will your child miss out on the perfect partner because they were weeded out? Will the wisdom of an older person be missing when you need it the most because someone decided they were unproductive? The reasons for destroying our unborn and eliminating our elderly and sick are not valid, at least not to the minds that see God’s Hand in our lives. Although we will all pay for this holocaust, we, as pro-life Catholics, know where the future of our world is going. We understand why scientific cures are not being discovered. We realize why there are a lack of vocations, either in religion or marriage. In this day the best blessing we can give anyone is to pray that they are surrounded by all the quilt pieces of life that should be there and that their children will always be surrounded by the people God planned on being there. This is a hopeful blessing although the sins of those who justify their wrongs can be seen in our lives. I love to quilt, yet as I sew, these thoughts go through my mind. I can only pray the bits and pieces of our lives will be eventually sewn together with as much love as I put into my quilts. 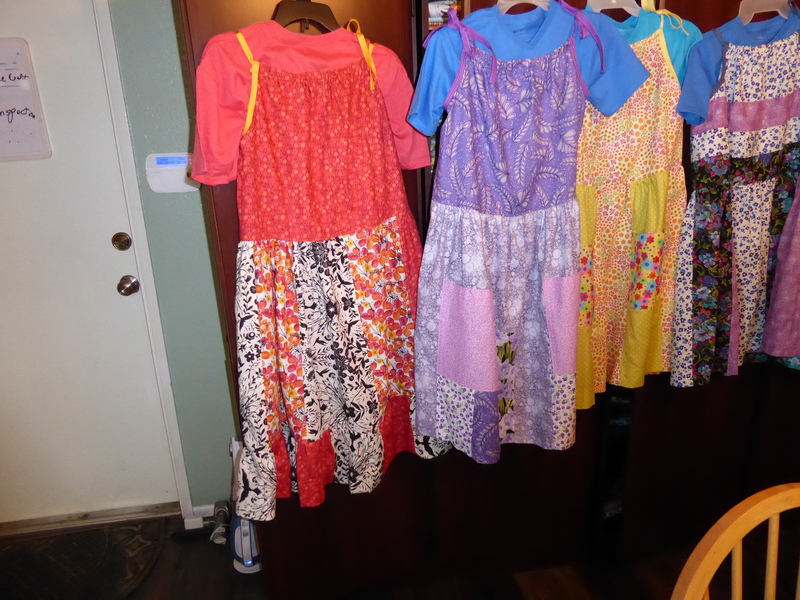 As many of you know, I love to sew and enjoy making dresses for Little Dresses for Africa. Needless to say, dresses of all sizes are needed. The basic pattern is simple to sew but once the little girls are heading into teen years, the original pattern could possibly be a little snug around the hips. My current ‘invention’ is to cut off the original pattern at the waist and then either half again or double the fabric for the skirt. It makes a becoming dress and there is more freedom of movement. Also, it is a good way to use bits and pieces of fabric to extend the width by getting artistic in how you add the extra fabric to the skirt. This is my trial run so we will see how things go! I provided a closeup of the waistline to show how the gathers went and the extra row of stitches for wear and tear. I’m finding there are lots of ways to make a basic pattern into something different. Putting the Pieces Together . . .
One of my favorite hobbies is quilting. I like nothing better than taking unwanted scraps of fabric and making them into a whole. Needless to say, many of my projects incorporate pieces of the same fabric. I never thought much about this until someone mentioned that you can tell a Barbara quilt as at least one patch of it matches a dress or shirt worn by one of my family! Whenever I give someone the gift of a quilt, there is a little bit of ‘me’ included. And there have been times when friends have gifted me with pretty fabrics left over from their projects. I guess the ‘wholeness’ of some of my quilts comes from sharing. Upon further consideration, I realized that we all contain bits and pieces incorporated from the world around us. We also share bits and pieces of our own experiences from the world around us. You don’t have to look any further back then your own childhood. Besides the physical traits, what else did your parents give you? You can remember words, reactions, or criticisms that have stayed with you until this day. You not only remember these words, they shaped the way you think, act, or react today. In other words, you have a few patches from the fabric of your parent’s lives! Well, this goes beyond our family. We are forever giving away scraps of ourselves each day through the way we treat others. What a responsibility God has blessed us with and how few people actually take it to heart! We wouldn’t give people ragged clothing, used cosmetics, or stale food. Why don’t we realize that thoughtless remarks and deliberate hurts are given away forever once they leave your lips? A personal remark is a piece of yourself freely given to another and will become a part of that person’s life. An unkind, personal remark is a mean offering.. If we believe our catechism, we know that we are all made in the image and likeness of God. Why don’t we think about this when we give our fellow human beings a piece of our mind and not of our heart? I think about this when I quilt and gather up my scraps of fabric to see if they will turn into a quilt. I think about this when I review my day and look over the bits and pieces of life that were handed me along the way. It is just like piecing a quilt as I muse over these feelings and determine where they will fit in the fabric of my life. Anger, irritability, and even meanness can be a part of our spiritual quilt – just like clashing colors worked into a real quilt. Do they belong there? Do you want them there? When you share your spiritual patchwork, are you passing the ugly, mismatched colors on to others? A quilt should be put together with happiness and enjoyed. And the overflow of colors you share should be gently tendered in kind words and soft phrases because others want to incorporate the best into their life’s quilt, too. Wholeness doesn’t just happen. When I make a quilt, I gather my scraps. If I need more, there are people who share. Do we always share in order to insure that others attain wholeness? How are we shaping the pattern of our neighbor’s life? It has come to my attention that even when you do not purchase sugar-free gum or mints, they still include aspartame and such in order to enhance the flavor. I know several people who cannot ingest the questionable artificial sweeteners. I also have found that many of the health store brands of gum usually lose their mint flavor within two chews. I recently, however, came across XyloBurst which is sugar free AND Aspartame Free. The sweetener is Xylitol which doesn’t have the problems other artificial sweeteners. And, for some wonderful reason, the company has managed to produce a softer gum which retains the flavor for a lot longer. A few other pluses are that it is non-GMO and gluten-free. Some studies have indicated that Xylitol may even reduce the risk of tooth decay and improve oral help. I found this product on https://www.swansonvitamins.com/. At the time of purchase, the price was under $8 for 100 pieces. Swansons does have sales so it may be more or less when you check it out. It comes in a nice plastic container which makes it convenient for stowing in the glove compartment or a handy nook in your kitchen.